An autoimmune disease is when your immune system is confused and starts to attack the body’s own cells, tissues and or organs when it’s not supposed to. Your body is working hard to defend itself against something potentially dangerous, such as an allergen, a toxin, an infection, or even a food and it fails to distinguish between the intruder and parts of your own body. Mistaking certain types of tissues for harmful substances, your body turns these antibodies against itself, causing inflammation and wreaking havoc on your organs. Autoimmune diseases affect 1 in 20 people and are an increasingly important global health concern. There are over 80 different autoimmune diseases and these range from common to very rare diseases. Some of the more common autoimmune diseases include lupus, multiple sclerosis, autoimmune thyroid disease, type 1 diabetes and rheumatoid arthritis. Food – chronic inflammation tied to food sensitivity such as gluten intolerance. There is a significant link between autoimmune diseases and gluten intolerance. If you have a thyroid condition, rheumatoid arthritis, lupus, type 1 diabetes or any other autoimmune disease then I can say without a doubt that gluten sparked a flame of your disease and when you continue to eat gluten, it is only adding more fuel to the fire. 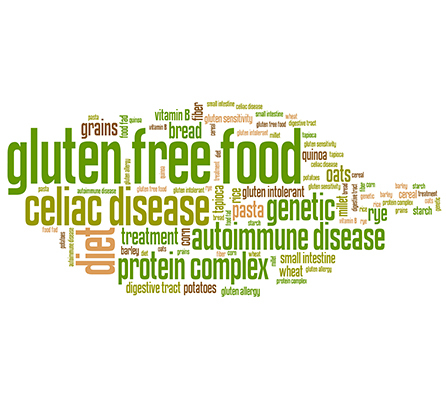 What Is The Link Between Gluten and Autoimmune Diseases? The gluten we eat today is not the same gluten that your grandparents ate. Scientists developed hybrid wheat in order to be able to create higher yields and fluffier breads, cakes and pastries. They also made it so it was able to dissolve into liquids and other products that didn’t previously contain gluten, such as cold cut lunch meats and beauty products like shampoo. The ‘modern’ wheat is a relatively fast, easy, cheap, highly addictive food to produce, so that’s why it’s now found nearly everywhere in our modern world. It’s in flour-based foods such as pasta and bread, cakes and cookies but it can also be used as a filler in medications and supplements; it’s the glue that holds meat substitutes together; it’s in body products such as lipstick and toothpaste; and it’s even in some grains that are marked gluten-free due to cross-contamination. We are not only eating a different kind of gluten than what our ancestors ate, we are actually eating and being exposed to an increased volume of it. As a result, our bodies are unable to tolerate this amount. This modified and now ubiquitous protein causes problems with both your gut health and your immune system, creating a perfect storm for the development and progression of inflammatory and autoimmune disease. Even if you don’t have an inflammatory or autoimmune disease, eating gluten can still be harmful to your health, as it has been linked with more than 55 diseases. The bottom line is that if you have an autoimmune disease, or any inflammatory condition, you shouldn’t be eating gluten, period. If you need more convincing on why it’s so important to eliminate gluten if you have an autoimmune condition, then here are 5 more reasons why. The proteins in wheat are gut irritants: imagine it like it’s a splinter digging into the lining of your gut, causing an inflammatory response. Gluten sensitivity is actually an autoimmune disease that creates inflammation throughout the body, affecting many organ systems including the brain, joints, digestive tract, heart and many more. It can be the single cause behind many different ‘modern’ diseases. To correct these diseases, you need to treat the cause which is often gluten sensitivity, not just the symptoms. Inflammation from wheat isn’t just a problem for those with celiac disease or non-celiac gluten sensitivity; it’s also a problem even for those who aren’t sensitive to gluten specifically. Amylase trypsin inhibitors (ATIs) provoke an inflammatory immune response in the GI tract by stimulating immune cells. This occurs in people regardless of whether or not you’re sensitive to gluten in particular. That inflammation is dangerous because it can cause leaky gut (intestinal permeability). Gluten plays a huge role in leaky gut because of gliadin – part of the gluten protein which triggers the release of zonulin – another protein that signals the tight junctions of the intestinal wall to open up, creating intestinal permeability (which you can see in the image below). 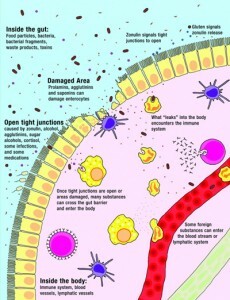 Intestinal permeability is a big problem as it’s a key factor in the development of autoimmune diseases. Molecular mimicry occurs when foreign substances get into the bloodstream and the immune system forms antibodies against it. This is exactly how the immune system is supposed to work. However, if that foreign substance looks enough like your own body’s tissue, then the antibodies formed to fight it might start attacking your own body’s cells, tissues and organs. Molecular mimicry may be the reason why people with celiac disease mount an attack on their own gut cells, as your immune system believes gliadin looks a lot like the cells lining the gut. Glyphosate, the herbicide used on GM crops such as ‘modern’ wheat, is also a potent antibiotic that can attack the bacteria in your gut. Unfortunately, the good bacteria in your gut, the kind that help with digestion and keeping the bad bacteria in check are more likely to be susceptible to glyphosate. On the other hand bad bacteria, including strains that cause salmonella and botulism, are highly resistant to glyphosate. This means that eating GMO foods can decrease your healthy bacteria and increase the bad bacteria, putting you at risk for candida overgrowth, leaky gut and inflammation which can also contribute to autoimmune disease. Brain fog and fatigue are symptoms of both celiac disease and non-celiac gluten sensitivity. On a more serious note, the gut inflammation and microbiome disturbances involved in the immune-inflammatory response to gluten may increase vulnerability to dementia and Alzheimer’s disease. Autoimmunity in general (whether it’s celiac disease or some other gluten-related autoimmunity) may be involved in anxiety and depression. This doesn’t mean that gluten is the cause of all mental health problems or that eliminating gluten will cure them. Mental health is complicated and there are all kinds of factors to consider. However, the point is that in some people, gluten may play a major role in declining health. The good news is that if you have an autoimmune disease, then removing gluten completely from your diet can dramatically improve your health. It’s not easy, but it’s worth it. Why not try giving it up 100% for at least 6 weeks just to see how your body reacts – you might be surprised! For more information on how to eliminate wheat for 6 weeks click here. For ideas of how to stock a naturally gluten free pantry, click here. I have just found out I am not absorbing B12 and I also find that I burp a lot during the day. Could this be related to gluten? I have cut out gluten for the last 3 days but the burping still happens. Are you taking PPI’s? Remember, in 3 days you won’t see much improvement- You need at least 4-6 weeks. Rather than telling people what they cannot eat then, what does not have gluten in it that is safe to eat?